Here’s the first installment of my Shopping in Mexico Adventures. When I actually lived in Mexico, the only time I would go to the arts and crafts market was when I had guests visiting from the United States. Of course, I loved having traditional Mexican elements in my home such as the intricately designed Talavera pieces and pewter bowls, serving platters, and accents, but I’m talking about typical items that tourists might buy as souvenirs. These handwoven laundry baskets brighten any room. Now that I don’t live in Mexico, I miss some of the traditional arts and crafts from Mexican states such as Michoacán, Oaxaca, and Guerrero. 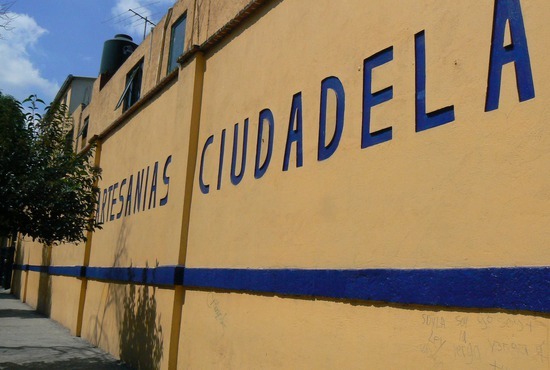 If you’re in Mexico City, be sure to make a stop at La Ciudadela. It’s a huge arts and crafts market that takes up almost an entire city block. La Ciudadela not only boasts the widest selection of merchandise from the best artisans in Mexico; the prices are unbelievably reasonable and haggling is encouraged to the point that it almost becomes a sport. Some of the best finds are glassware, hammocks, linens, trays, pewter, silver, and paper mâche. There’s plenty of guarded parking available. My driver parked and accompanied me on my shopping adventure. He must have thought I was slightly over the top, because I bought enough treasures to fill a large suitcase, but I only spent less than $150! We walked through the maze-like rows of stalls in the market. It’s neatly organized so that all of the baskets are in one place, all of the glassware is in one place, etc…This is particularly helpful for bargaining for a good price, because everyone is selling similar items. My shopping strategy involves carrying lots of small bills in different pockets or compartments and then paying with low denomination bills so that you can pay with exact change. It is a little silly to bargain for a price of $70 pesos down from $100 and then pay with a $100 peso bill. Ha! Real Mexican Sombreros look fantastic on the wall of my classroom! 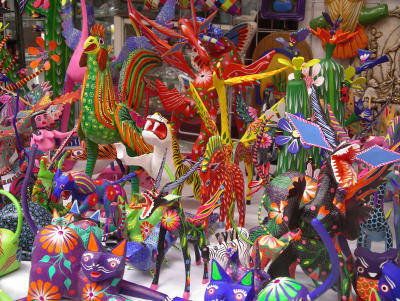 Alebrijes are hand painted carved wooden animals made from the copal tree. The Oaxacan artists all sign their work on the bottom of each piece. I bought the most beautiful pink pegasus-unicorn with purple polka dots and other ornate decorations. It measures about a foot high and has an equally large wing span. The price? About $15 dollars. 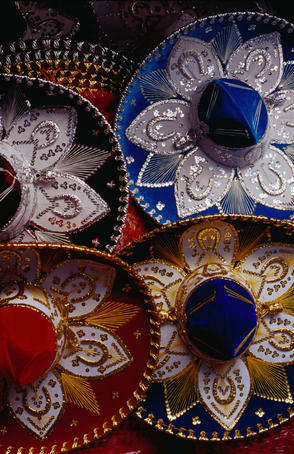 I saw similar items for sale in the Mexico pavillion in Epcot for about $100 dollars. On a kind of funny note, I debated about packing tiny rolls of toilet paper with me for this Mexico trip. Since I wouldn't really be doing a lot of touring, I didn't think that I would need it. What is the big deal with toilet paper, you ask? Well, if you're in a market or at the pyramids or at a rest stop along the toll road, you'll need to pay a few pesos to use the rest room. This entitles you to access to a semi-clean bathroom and about 3 squares of toilet paper. That's it. There's a lady sitting at the entrance of the bathroom to collect your coins and hand you the pre-torn squares of single ply paper. Needless to say, I'm very glad I brought my own stash because 3 pesos at La Ciudadela got me exactly three tiny squares. Funny! At the other end of the spectrum, the impeccable rest rooms in restaurants where I ate in Mexico and at the wedding I attended had multiple attendants working who handed you fresh towels in the large, luxurious salons that were truly rest rooms. They even had mints, hair spray, and other toiletries that one may need to freshen up! Stay tuned for more of my Mexico adventures! This is really interesting - I am making mental notes! I love being able to buy handmade products in markets - and its great to support local people directly, and have lots of unique pieces to take home of course! Those laundry baskets would look adorable in dorm rooms! Locely finds Bethany! We were the same way in Honduras and Panama....only went to the craft places when we had guests in town, but of course my mother and I wish we had bought more!